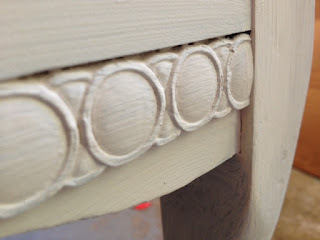 I have been wanting to try Annie Sloan Chalk Paint (ASCP) for some time but the frugal side of this thrifty girl couldn't hardly come to grips with the price. Well, I finally bit the bullet and went to buy a quart and then I ended up having to wait two weeks on the ASCP in Old White to be restocked! It finally came in last weekend but I was hosting a baby shower for a co-worker. However, I could hardly contain my excitement so I did manage to find some time to put one coat on the piece I'm making over. Here's a sneak peek! I can't wait to get out there and really get started!